There is something magical that attracts people to visit the mountains. Perhaps it is the view of the world from high up, a sense of freedom or simply the feeling of being on top of the world. From a significant height, towns look small, vehicles resemble toys and humans seem insignificant. Another great attraction is the feeling of isolation. 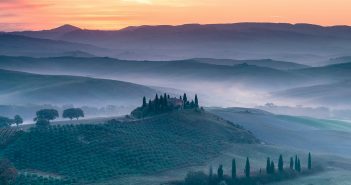 As soon as you join a path and start walking further from the crowds, you are at one with nature, and this, to me, is one of the most important aspects of landscape photography. Not everyone visiting the mountains is a landscape photographer of course – there are walkers, climbers, mountain bikers or simply nature lovers – all driven by a similar passion, love of nature and sense of freedom. I had been planning to visit the Dolomite mountains in Italy for a very long time and I finally managed to arrange it for this October. My trip was a combination of photo workshop ‘recce’ and a holiday with some very good friends. We stayed at three different locations around the Dolomites as we wanted to visit the best parts of the area. We wanted to experience the views from the high passes and the incredible vistas of the high peaks, Alpine meadows that are reminiscent of Switzerland, as well as experiencing 360 degrees views during a high altitude sunrise. 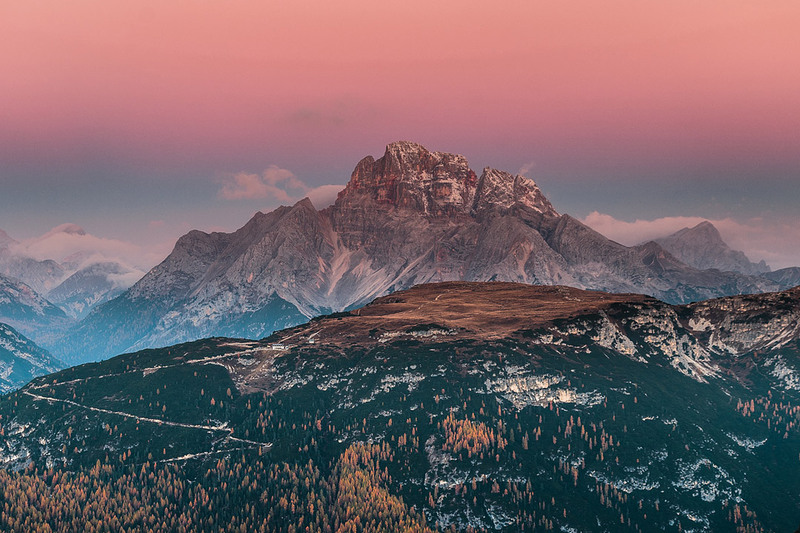 I had seen views of Tre Cime during sunrise in the past; beautifully warm light bathing the tops of the three peaks, but mainly views of the north face of the mountain, which indicates that the captures happened during summer. The day we arrived at the Tre Cime area we decided to walk on one of the paths. We soon realised that the best early morning views at this time of year would be from the opposite side of Tre Cime, a bit further south. The next morning’s weather forecast was for clear sky, so we left the hotel just after 5am and after a 35 minute drive, we were parking as close to the path as possible. Loaded with all our camera gear, warm clothing (as there was some ice on the ground), and head torches to help us stay on the path, we embarked on a 45 minute walk that included a couple of descends but mainly ascents. It has to be noted that the area is at a height of 7000 feet and oxygen levels are lower than normal. Ascents are much harder than at lower altitude but not impossible, you just need to allow for more time. Indeed, a while later we were standing on a plateau and we seemed to be on top of the world. The first colour had already started appearing in the east and there was low cloud in the valley below, which really enhanced the impression of the altitude. As soon as proper breathing was restored, tripods were setup and the first shutter activation sounds could be heard. Everyone was in awe, no time to spare but to keep catching the glorious light while it lasted. There were pictures to be taken everywhere, literally 360 degrees, from glowing under the first sunlight peaks to Alpen glow above the peaks behind us. “Look behind you” was the phrase of the day, as everyone was trying to catch as many pictures as possible. Ten minutes later and our incredible experience was all over, each of us vowing that we would go back again. I will be running a photo tour in the area next October. If you wish to join me on this breathtaking adventure, you can book your place now by following the link below. Some of my followers have already pre-booked their place, so it would be advisable to book yours as soon as possible to avoid any disappointment. If you enjoyed this article, please leave a comment in the comments box below. Your acknowledgement will drive me to write even more free articles for you.